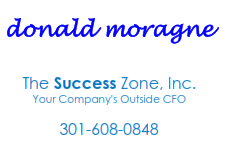 THE SUCCESS ZONE is skilled in business development and business management for corporate, pass through entities, non-profit organizations, business professionals and professional practices. Proficiency, preciseness and client satisfaction are the hallmarks of The Success Zone. Your business deserves proactive financial management. Our firm is leading the inevitable change by redefining financial management and bringing profitability consulting to the small business community.